When it comes to weddings, Sweet Pea Hill’s Carrie Koster knows first-hand how difficult in can be to achieve the perfect décor. She’s been in charge of aesthetics for two family weddings in the past two years and says while do-it-yourself decorating is something she enjoys, it can be time consuming and difficult to find those vintage-inspired items currently trending in wedding décor. “We have done a lot of our own work for those weddings and really enjoyed it, but also saw the challenge of coming up with those items that you would like to style your wedding without having to run all over to every garage sale in town looking for 10 metal water buckets or whatever,” she says. 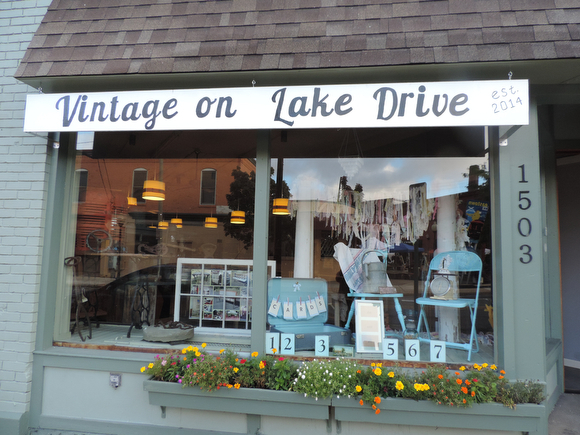 So Koster has teamed up with her daughter, Audrey Noorman, to focus her 15 years of resale and antique experience into one place: Vintage on Lake Drive, a family-run business. 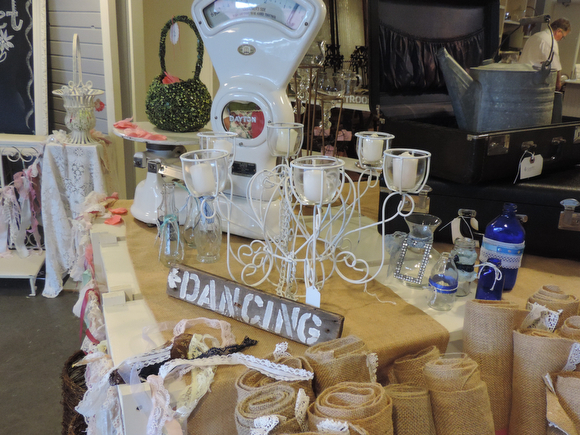 Vintage on Lake Drive will bring together the wedding resale business she and her daughter run, Sweet Pea Hill, with her husband Bruce’s furniture rehab business, Good Pasture Farm. While Sweet Pea Hill focuses on wedding resale and consignment, her husband’s Good Pasture Farms specializes in up cycling and repurposing of industrial and farm-style furniture. Bruce will also give consultations on custom rehab projects for customers who have an inherited antique item, have purchased an item they want customized, or have an antique they can’t use in its current form. For example, she says, he’s able to take a porcelain stove and turn it into a wet bar. “Many people are up cycling and repurposing things but there aren’t a whole lot of people you can go to with your dream and say, ‘Can you help me with this?’” she says. Vintage on Lake Drive briefly opened its doors to customers for walk-throughs only during the recent Eastown Streetfair, but Koster says she doesn’t anticipate opening the 1,100-square-foot space at 1503 Lake Drive officially until the first week of October. In the meantime, she hopes to receive more funding to purchase additional resale items through the organization Start Garden, which uses an online voting system to invest in area startups. Though voting closes today at noon on Sweet Pea Hill’s online application, she plans on reapplying if she doesn’t get enough endorsements the first time around. “You want that particular style or you want to create an environment for your events, but you don’t necessarily want to own those things forever,” she says.